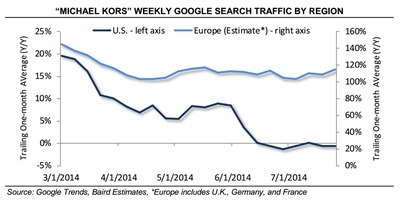 The Michael Kors brand might be past its prime. The fashion label, which enjoyed a stunning rise in popularity in recent years, is facing new challenges. Forbes notes that Michael Kors is no longer a billionaire because shares have declined in recent months. Here are a few big problems with the brand. 1. Everyone is wearing Michael Kors. Widespread popularity is the “kiss of death for trendy fashion brands, particularly those positioned in the up-market younger consumer sectors,” industry expert Robin Lewis writes on his blog. Lewis compares Michael Kors to Tommy Hilfiger, which reached its peak in the late ’90s. Other brands who have experienced this phenomenon include Juicy Couture, Jordache, and Coach. 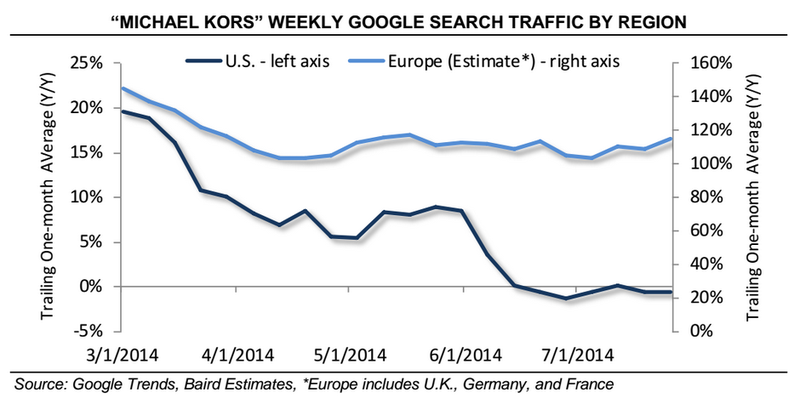 Baird Equity ResearchGoogle searches for the brand are declining in the US. 2. Inventories are piling up. Michael Kors is entering the current quarter with a 65% inventory increase, writes retail equity analyst Marie Driscoll. While the company says that the excess inventory is because of the company taking the e-commerce business in-house, Driscoll is sceptical that it will sell. She also compares Michael Kors to the Tommy Hilfiger collapse more than a decade ago. Yahoo! FinanceShares are down 25% in six months. 3. The strategy could backfire. In other words, consumers won’t pay $US300 for a department store Michael Kors bag when they can get one at the outlet mall for half-price.